Healthy Tract™ Technology: A proprietary blend of select ingredients helps support urinary tract health by lowering pH levels and balancing calcium and phosphorous levels for optimum function in show lambs on nutrient-rich show diets. Advanced amino acid profile: Multiple sources of protein, by-pass amino acids and guaranteed amino acid levels help create a winning profile promoting optimum performance, including muscle development, growth in frame, bloom and body condition. Superior palatability: Innovative formula with superior palatability encourages consumption in young, early weaned lambs and helps keep lambs on feed for proper intake levels and superior performance from start to finish. 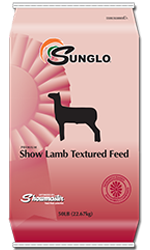 Performance-driven features: A powerful combination of added features promotes superior performance in show lambs, including Omega-3 fatty acids, added yeast culture, direct-fed microbials and organic trace mineral complexes of selenium, zinc, manganese and cobalt. Active nutrient supply: Elevated nutrient levels, enhanced nutrient availability and superior overall nutritional balance promote unprecedented performance in show lambs at every stage. Show micronutrients: Select micronutrients support strong bones, a healthy immune system and muscle mass found in superior show lambs, including Vitamin E, thiamine, biotin and zinc. Thiamine (Vitamin B1) added: Supports the thiamine nutrient requirement for lambs. Thiamine is important for normal brain function.